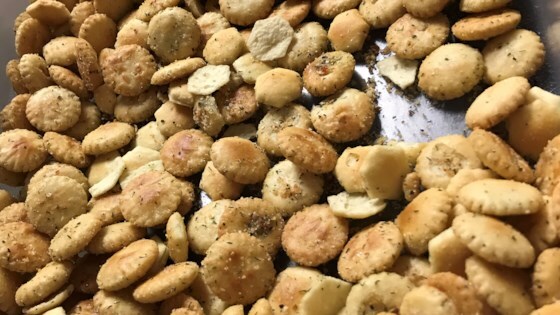 "These seasoned oyster crackers make an easy snack for any party occasion." very quick and easy to put together and make. tasty too! be sure to stir them after ten minutes and "drain" evenly on paper towels to take away some of the greasy-ness. I have been making these crackers for sometime and I love them. Especially around the holidays. Their savoriness is a nice change from all of the sweet stuff that is out around Christmastime.